Boston events March 2019. Things to do in Boston. Hit balls with the latest clubs, take seminars, learn tips, plan golf trips, and visit 100 exhibitors at National Golf Expo Boston at Seaport World Trade Center. Focusing on beer brewed in Massachusetts, Mass Beer Week features tap takeovers, beer dinners, tastings, and parties in tap rooms, breweries, brew pubs, and restaurants. Irish Comedy Tour is an evening of Irish comedy and music featuring “a band of hooligans” at City Winery. The topic of Moving Images Film Festival changes each year. It’s educational and inspirational, followed by a discussion at Harvard Medical School. Pre-register. Donation. Mardi Gras Speakeasy features a speakeasy band playing hot jazz, dirty blues, and modern music with a retro vibe, plus dancers and a magician, with Prohibition-era cocktails for sale at Bull Mansion New American Bistro in Worcester for age 18+. Dress code. Chillin’ on D has food trucks, five ice bars, ice carving demonstrations, bands (Sat./Sun. 3 to 6 p.m.), and DJ music (daily to 10 p.m.) at The Lawn On D. Free. The Social Enterprise Conference features speeches, panels, and workshops on using business principles to improve lives and the world, at Harvard Business School on Saturday and Harvard Kennedy School on Sunday. Enjoy Jewish-themed appetizers, entrees, and desserts made by top Boston chefs, with beer, wine, and cocktails at Beyond Bubbie’s Kitchen at Back Bay Events Center. Get a special fixed price for lunch or dinner during Dine out Boston, which is held in March and August. No registration is required. Saturday is not included. Guitar Night: R&B/Funk Showcase presents “six stellar guitarists leading their bands in a program of R&B/funk originals and covers” at David Friend Recital Hall. Harpoon St. Patrick’s Festival has beer, food, and live music in heated tents at Harpoon Brewery. Watch local groups perform in the A Cappella Festival at Somerville Theatre for a chance to represent New England at the national finals in May. Sip bourbon and taste bacon treats at the Bourbon & Bacon Fest at the Castle at Park Plaza for age 21+. Enthusiastic young dance troupes perform Jewish and Israeli dances to lively music at the Israel Folkdance Festival at MIT in Cambridge. Harpoon Shamrock Splash features a costume contest, a group photo, a dash into the cold water, and then a beer at Curley Community Center. Chinese New Year Celebration begins in Cambridge’s Winthrop Square at 12:30 p.m. with food samples, followed at 1 p.m. by a lion dance that begins a parade from the square to The Hong Kong Restaurant for “an afternoon of food, art, and music.” Free. The Boston Flower and Garden Show fills Seaport World Trade Center with garden displays, floral arrangements, a marketplace of plants and garden products, lectures, and demonstrations by experts. Learn to dance three 19th-century Irish Ceili dances taught by an instructor on Vintage Irish Dance Night at Charles River Museum of Industry & Innovation in Waltham. Costumes or green attire is welcome. Skip cover charges and often lines at multiple bars. Celebrate the holiday in style with traditional Irish music at A St. Patrick’s Day Celtic Sojourn by WGBH. A Little Bit of Ireland celebrates St. Patrick’s Day with Irish tenors, step dancing, an Irish band, and an Irish comic at Reagle Music Theatre in Waltham. Join 600,000 people celebrating Boston’s Irish heritage at the South Boston St. Patrick’s Day Parade, which begins at Broadway subway station and ends at Andrew Square. Taste menu items from dozens of restaurants; drink wine, beer, and cocktails; and bid in a silent auction for charity at the $150 Taste of the South End in the Cyclorama at Boston Center for the Arts for age 21+. Screening alternative film and video, Boston Underground Film Festival (BUFF) is “a shining beacon of the weird, the wonderful, the nasty, the niche, and the eclectic” at the Brattle Theatre in Cambridge. Boston Tea Party offers 90 swing-dance workshops (many for beginners), plus exhibitions, competitions, and lots of social dance time in ballrooms at Boston Marriott Newton. Taste professional pairings of wines, gourmet chocolates, and artisan cheeses at Chocolate, Wine & Cheese Festival at the Radisson Hotel in Nashua, NH for age 21+. See hot rods, competition cars, specialty vehicles, concept vehicles, entertainment, and a chop shop at World of Wheels at Seaport World Trade Center. A ticket to Fun in the Tropics includes appetizers, a glass of beer or wine, animal-themed games, animal encounters, talks about flightless birds, and a cash bar at Franklin Park Zoo for age 21+. Celebrate the Vernal Equinox (when days and nights are equally long) with songs, entertainment, and refreshments at Spring Sing by Revels in Watertown. Students and faculty perform music from around the world, sometimes in costume, at the International Folk Festival at Berklee Performance Center. Boston Design Week has roughly 80 events about architecture, environmental and landscape design, urban design, interior design, fashion, photography, graphic design, industrial design, and studio design. Enjoy an elegant evening of food, wine, beer, music, and local celebrities at the Waltham Food, Wine & Craft Beer Festival at the Charles River Museum. PAX East features video games, tabletop games, computer games, panels, entertainers, exhibits, and contests at Boston Convention & Exhibition Center. See contemporary gay, lesbian, bisexual, and transgender films at Wicked Queer. 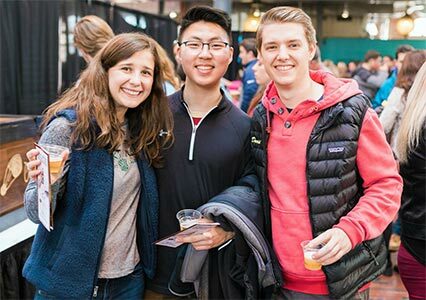 Try New England-made craft beers, ciders, and cheeses from 25 brewers and 12 creameries at Boston Beer & Cheese Fest at the Cyclorama. Boston Tattoo Convention has tattoo artists, vendors, seminars, and entertainment at Hynes Convention Center. Hear 50 artists performing both Hindustani and Carnatic music styles in 15 concerts at Learnquest Music Conference, with demonstrations, lectures, films, and workshops at Regis College in Weston. Hear stories or attend workshops at the Sharing the Fire: Northeast Storytelling Conference and Festival at Hotel 1620 Plymouth Harbor. Salem Film Fest features documentary films with strong technical elements and interesting visual approaches at CinemaSalem and other venues. Harvard archaeology students share their experiences from excavations around the world at the Amazing Archaeology Fair in the Peabody Museum of Archaeology and Ethnology. Examine artifacts and try activities. Free admission for state residents who arrive before noon.